Hoop mounted badges are common on George B. Stone & Son drums dating from the mid 1910s through the early '30s. What is not common is to see a badge different from those typically used on the overwhelming majority of Stone drums. Such is the case however with a drum recently listed on eBay by a seller from Lowell, MA. In some ways this badge is a real stumper. It's different in size and shape than any other badge ever used by Stone. Since it is so unusual, it stands to reason that very few of these badges were produced and installed on finished drums. Thankfully, there is a paper label inside the shell which clears some things up. The label is one we've seen before and is not all that uncommon on Stone drums of the mid to late 1930s. All other indications point to a similar conclusion. There is no serial number on the label. (Serial numbers were common from 1922 up until about 1935.) The drum is simple in design using single tension tuning. And the shell appears to have a small metal grommet which was used only on very late Stone drums. So where does all of this leave us? 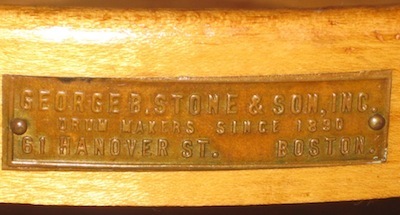 This badge must have been used in very small quantities near the end of Stone & Son's production in the mid to late 1930s.